Global Freight Transport produces 10% of Greenhouse Gas Emissions. Freight transport produces up to half the toxic diesel particulate matter (PM) emissions and 45% of the Nitrous Oxides. 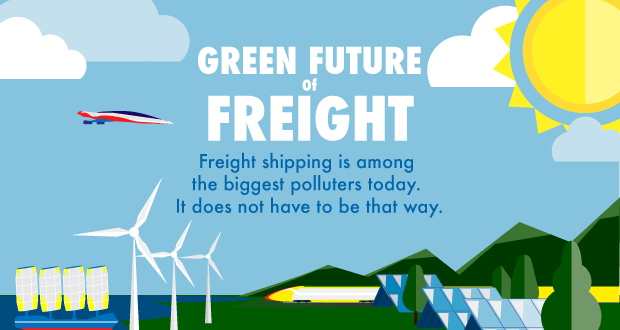 Without change, emissions from freight are predicted to increase 290% by 2050. Emissions from cargo ships are 3% of greenhouse gases today, but without change will grow to 6% by 2020 and 15% by 2050. Cargo ships are the most rapidly growing source of NOx and SOx, predicted to produce 10% more than all land based emissions by 2020 and 40% more than land emissions by 2030. Operational measures and full implementation of existing technologies can reduce ship energy consumption and CO2 emissions by up to 75%. Moving long haul freight by rail can immediately reduce CO2 emissions from freight transport over 60%. Implementation of scrubber technology on cargo ships can reduce NOx and SOx immediately by over 90%. In north America, 80% of the trucks return empty, and 30% of the trucks on road are empty. Filling empty trucks via a centralized market and coordination can immediately reduce air pollution and greenhouse gas emissions from freight by 30%. The future of ocean transport is hybrid electric/wind powered ships, with CO2 emissions reduced by 60%+ and SOx and NOx emissions reduced 90%+. Sustainable electric rail, powered by wind and sun, offers zero emission long haul freight near term for the continental interior regions. Low and zero emission heavy duty engines are already available for “last mile” delivery from rail. Wind, solar and hydro-powered electric vehicles, and hydrogen fuel cell hybrids, offer the best long-term zero emission solution for those regions that will never be accessible by rail or water. We partnered with SmartWay to work with green freight transportation companies. Compare freight quotes and choose a green carrier in our freight shipping marketplace. Diesel Particulate Matter (DPM): DPM is a component of diesel exhaust that includes soot particles made up primarily of carbon, ash, metallic abrasion particles, sulfates and silicates. DPM is a Group 1 carcinogen, causing lung cancer and associated with bladder cancer. g CO2/tonne/km: Carbon Dioxide in grams emitted per metric ton of freight hauled per kilometer. Greenhouse gas or GHG: A gaseous compound that is capable of absorbing infrared radiation, thereby trapping and holding heat in the atmosphere. Hydrogen fuel cell hybrid: A hydrogen fuel cell hybrid vehicle uses a fuel cell, instead of a battery, to power its on-board electric motor. Hydrogen fuel cell vehicles are classified as zero-emissions vehicles that emit only water and heat. NOx or Nitrous Oxides: NOx are greenhouse gases and air pollutants. Over a period of a hundred years, NOx has between 265 and 310 times more impact per unit mass than carbon dioxide. It also creates ground level ozone, the most dangerous component of photochemical smog. Scrubber technology: Scrubber technology reduces air pollution by removing solid and liquid particles and pollutant gases using a liquid. SOx or Sulfur Oxides: SOx are compounds of sulfur and oxygen molecules, commonly Sulfur dioxide. Sulfur oxides cause reduced lung function, increased incidence of respiratory symptoms and diseases, irritation of the eyes, nose, and throat, and premature mortality. Green freight initiative is really impressive move in shipping industry. Appreciate !